As many of you will already be aware, this Saturday is an exciting day in the history of the world. According to the eBible Fellowship – and who can argue with them based on the robust and convincing evidence they provide? – on this Saturday, May 21st, true Christians will be removed from this world and taken to heaven, there to watch the 99.9% who weren’t chosen cope with a five-month-long global fire before the world is finally put out of its misery on October 21st. Yes, the cream is being skimmed off the top of humanity; and as often happens, without any cream we may find that we experience some burning. 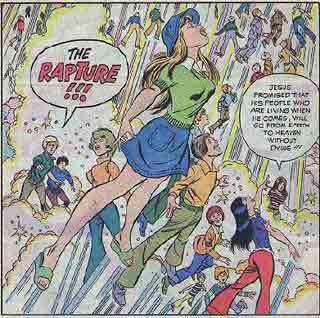 I love Rapture cults. This is going to be evident later in the year when my novel comes out, and frankly I would have appreciated it if the eBible Fellowship could have chosen a later date for this Rapture, as it would have provided a great gimmick for marketing my book. As it is, I’m just grateful I’m being published electronically and not in paper, since all the paper will have long since been burnt. I can only hope Kindles are flameproof. If [...] you find yourself suddenly ascending into the air on Saturday, I wish you well, and I hope that you enjoy the next five months watching the rest of us running around screaming “It burns! It burns!” On the plus side, it’s going to be very interesting to see how people react to the impending knowledge that there really is a God, he really does adhere to the beliefs of a minor evangelistic Christian group, and he really is extremely pissed off with the world. I mean, should we all convert, or what? Is there any point? 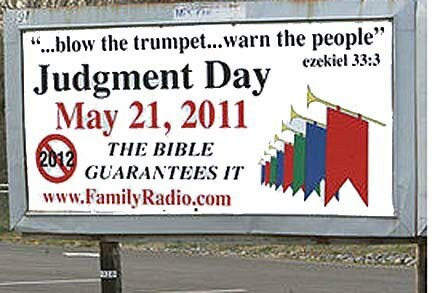 The obviously-infallible eBible Fellowship is clear that after this Saturday, you’re either saved or you’re not, and those who aren’t are going to be denied any kind of afterlife. (Don’t bother with those good works, and praying is definitely going to be pointless). God no longer cares enough even to torture us for eternity; we’ll just die and that’s it, gone forever. Which, coincidentally, is what I believed was going to happen to me anyway. So all that’s really changed from my point of view is that a few people get to live for eternity. Good luck to them. I am a little unclear, though, on God’s motivation is for the five-month gap between Rapture and destruction, if we have no hope of redeeming ourselves. My best guess is that he has some really big sausages he wants to barbecue. Except that a true Christian, surely, would never enjoy the suffering of others, particularly when the others will almost certainly include loved ones and family members (not to mention pets, unless you’ve taken steps to protect them), so I presume that for you as well, most of the summer will be spent feeling fairly miserable. Still, at least you won’t be on fire.